Anaconda is one of the longest and heaviest snakes in the world. 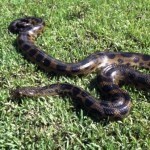 Anacondas live in the Amazon jungles of South America near rivers, lakes and swamps. They spend most of their time in water. They are very well camouflaged and aren’t easily seen. They like to live alone and are rather shy. 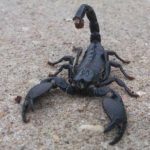 This animal is not poisonous. Anacondas are members of the boa constrictor family of snakes. That means that they kill their victims by squeezing them. They coil their powerful bodies around the prey and squeeze it tighter and tighter – until the animal can no longer breathe. 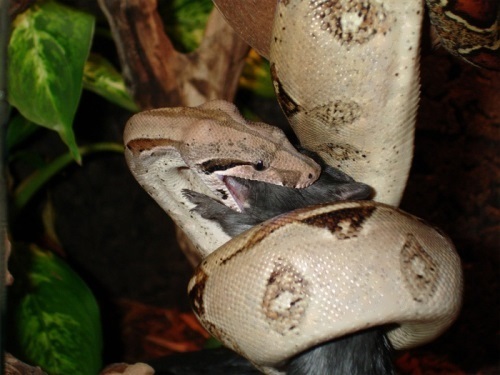 Then the snake swallows its prey whole. 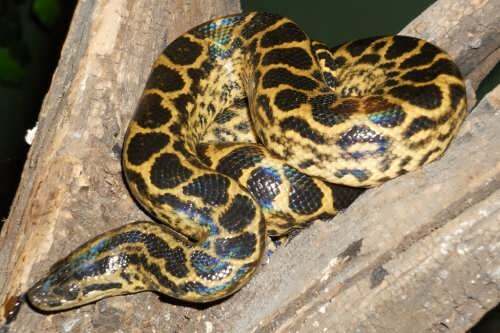 Anacondas usually hunt at night. Anacondas hide and wait for something tasty to come by and then make a surprise attack. They also like to drown their victims before eating them. 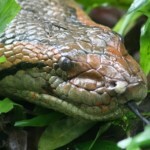 This snake eats fish, caimans, birds, turtles, wild pigs, other snakes. 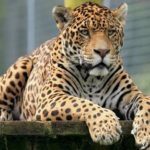 Sometimes they attack bigger animals as well, such as jaguars. They can open their mouths wide enough to fit around an entire goat. After a big meal they can live without food for months. 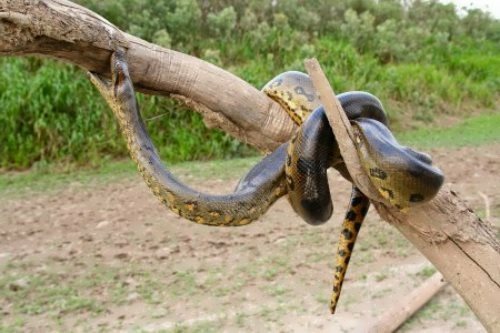 Although the anaconda spends much of its time in water, it may also crawl on land and even climb into trees to catch birds. Anacondas are slow-moving snakes on land, but they are wonderful swimmers. 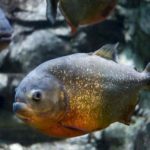 They are probably the best swimmers in the Amazon. 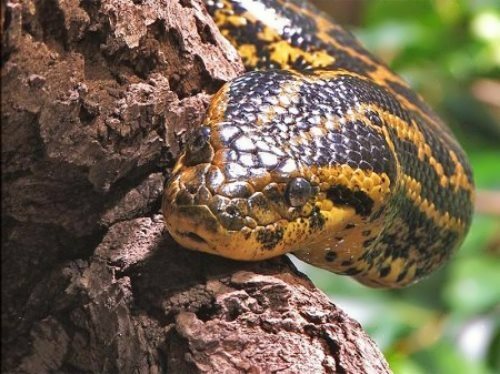 There are four types of this powerful snake: the Dark-spotted anaconda, the Yellow anaconda, the Green anaconda and the Bolivian anaconda. The world’s biggest anaconda is the Green anaconda. 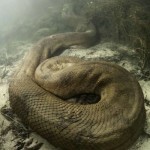 It’s also the heaviest snake of the world. The maximum recorded length of the body is more than 7.5 meters, and weight – 250 kilograms. 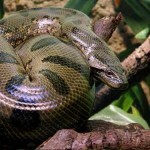 Asian python is longer – 9.7 meters, but anaconda is much heavier. The markings on anaconda’s tail are unique, just like our fingerprints. 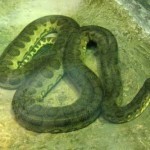 Nine months after mating, female anacondas give birth to large litters of live young. A litter has 14 to 82 young. 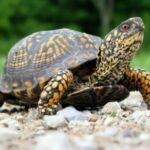 Each young measures more than 2 feet (0.6 meter) long. 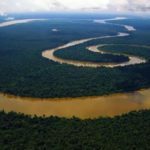 What to do if you were attacked by an anaconda? 1. If you are attacked by an anaconda, do not run. It moves faster. 2. Lie on your back. Firmly squeeze the legs and keep your arms to the body. 3. Push the chin to the chest. 4. The snake starts to crawl on you. 6. 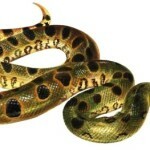 After you are examined by the snake, it will start to swallow your feet – Anaconda always starts with the feet. Let it swallow the foot and ankles. Do not panic in any case! 7. Then the snake will begin to swallow you further. It takes a lot of time and all the time you will need to lie very still. 8. 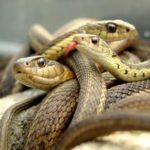 When the snake swallow your feet on the knee, begin to act – slowly, trying not to make unnecessary movements, pull out a knife and carefully enter it in the side of the mouth of the snake. Then abruptly jerk up the knife, slicing through her head. 9. Always carry a knife. 10. The knife must be sharp.